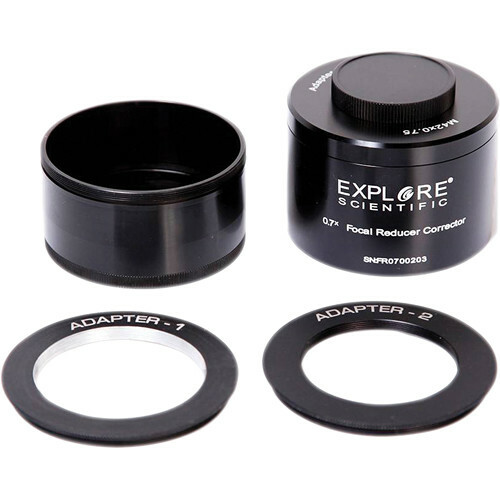 The 3" Field Flattener/0.7x Focal Reducer from Explore Scientific is a dual-purpose accessory for astrophotography and astroimaging. 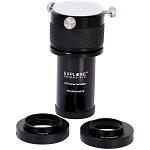 Use the two pieces together or separately to finely tune your telescope for capturing the best possible images. As a field flattener, it corrects for the inherent spherical aberration of curved lenses. Uncorrected, this aberration causes images to appear distorted at the edges of the field of view. As a focal reducer, it reduces the focal ratio of the scope by 0.7x, which translates into wider fields of view with shorter exposure times. 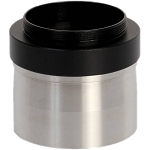 This fully multicoated optic fits 1.25" focusers and comes with an adapter for use with 2" focusers.